After cofounding points.com, Darlene Higbee Clarkin did something not many technologists would do on early retirement; she enrolled into a holistic nutrition school. There was just one problem. The industry is lacking the technology needed to help educate the masses. “I saw that, with my background, I could build something extremely different and unique. I could get nutritional information to masses pretty easily, and make it affordable for all” she recalls. So that’s what she did. She brought on her teacher, Orsha Magyar, who is a registered holistic nutritionist (RHN) with a background in biopsychology and neuroscience, to be the brains behind nutritional scientific advice at WholeLife Holistic Nutrition Inc. – a company that will offer mobile apps and nutritional services at myWholeLife.ca. Meanwhile Darlene would be the magic running things on the technical and business side. Both these women are aligned in the belief that Western and holistic treatments should complement one another. “What we’re trying to do is bridge the gap between Western medicine and holistic nutrition,” explains Darlene. The idea is to be integrative, and to work with other healthcare practitioners to support and enhance a patient’s chosen therapy. There is a personal side to this story too. Darlene’s dad lost both his legs to diabetes, and her mother, a 10-year cancer survivor, is in hospital every three to four months to treat infections. Darlene thought she was learning from her parents. She stayed athletic and ate well. But as she got older she started having the same symptoms as her dad. The web site and apps help people like Darlene access nutritional advice conveniently online for a fraction of the cost. The web site, which launched on May 17th, will introduce nutritional consulting services by the Fall. You will be required to fill out an extensive health questionnaire in order to receive a comprehensive program developed by leading integrative nutritionists. The subscription service will also offer personalized meal plans and recipes, in addition to diet, supplement, lifestyle suggestions, and more. The newly launched Quick Tips App will send mobile devices a daily tip based on the latest research in nutritional science in an easy-to-read format. 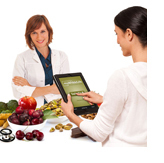 “We’re also at your fingertips…wherever you are you will have access to a holistic nutritionist,” she continues. Darlene envisions a future for myWholeLife that will include working with top experts in the field and developing a board of advisors who will be the scientific, medical, and nutritional backbone of the services offered. Her goal is to increase awareness of the power of holistic nutrition and to revolutionize how these services are delivered. myWholeLife is on a mission to make nutrition accessible to everyone, affordable to everyone and even easy for everyone. With our new Quick Tips App (along with 20-some health apps to follow), and nutritional service in the fall, we hope to bring professional nutritional advice down to a fraction of the cost. And the best part is, your nutrition will follow you wherever you go, keeping you up-to-date on how you can improve your eating and lifestyle habits for a better life.